A neurovascular unit on a chip being developed by Vanderbilt University researchers. (Vanderbilt University Photo/ John Wikswo). The National Institutes of Health will award funds to support the next phase of its Tissue Chip for Drug Screening program to improve ways of predicting drug safety and effectiveness. Researchers will collaborate over three years to refine existing 3-D human tissue chips and combine them into an integrated system that can mimic the complex functions of the human body. Led by the National Center for Advancing Translational Sciences (NCATS), the program will support 11 institutions at $17 million in 2014 with additional support over the remaining two years if funds are available. Because these tissue chip systems will closely mimic human function, scientists can probe the tissue chips in ways that they aren’t able to do in people, and the knowledge gained may provide critical clues to disease progression and insights into the development of potential therapeutics. Fifteen NIH Institutes and Centers are involved in the coordination of this program. Current funding is being provided by NCATS, the National Institute for Biomedical Imaging and Bioengineering, the National Cancer Institute, Eunice Kennedy Shriver National Institute of Child Health and Human Development, National Institute of Environmental Health Sciences, NIH Common Fund, and NIH Office of Research on Women’s Health. Researchers create human tissue chips using techniques that result in miniature models of living organ tissues on transparent microchips. Ranging in size from a quarter to a house key, the chips are lined with living cells and contain features designed to replicate the complex biological functions of specific organs. “The development of tissue chips is a remarkable marriage of biology and engineering, and has the potential to transform preclinical testing of candidate treatments, providing valuable tools for biomedical research,” said NIH Director Francis S. Collins, M.D., Ph.D. Approximately 80 percent of candidate drugs fail in human clinical trials because they are found to be unsafe or ineffective. More than 30 percent of promising medications fail due to toxicity, despite promising preclinical studies in animal and cell models. These models can be costly and poor predictors of drug response in humans. 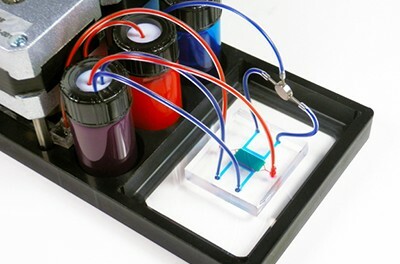 NIH’s Tissue Chip for Drug Screening initiative is a collaboration between the NIH, Defense Advanced Research Projects Agency (DARPA) and U.S. Food and Drug Administration. NIH has committed nearly $76 million over the course of the five-year program, which was launched in fiscal year 2012. In the first two years of the program, researchers developed individual human tissue chips that demonstrated organ functionality, mimicked human biological responses, and generated more accurate data than conventional cell and animal testing methods. Tissue chips include those for the heart, liver, blood-brain barrier, blood vessels, kidney, gastrointestinal system, nervous system, adipose (fat), and models of tumors and metastasis (the spread of cancer). In addition, chips mimicking both male and female reproductive systems will be critical to evaluating differences in response to drug exposure. While researchers can use individual chips to study single tissue and organ responses, the integration of chips into a human-like system will enable the real-time measurement of the effects of a drug. The effects will be measured within and across various organs and tissues by which a drug is introduced into the human body, such as the liver and digestive system, as well as the drug’s effectiveness in the organ or tissue it targets, such as the kidney or heart. The NIH award recipients are listed below. For more details about each project, visithttp://www.ncats.nih.gov/tissue-chip-awards2014.html. A 3-D biomimetic liver sinusoid construct for predicting physiology and toxicity D. Lansing Taylor, Ph.D.
Steven C. George, M.D., Ph.D.
Two project teams funded by DARPA will work with the NIH researchers to develop the platforms that are able to support 10 organ systems. Researchers from the NIH and DARPA programs have formed a successful and productive partnership that fosters collaborations and shared resources. During the next phase, researchers also will increase the use of induced pluripotent stem cell (iPSC) technology as a renewable human cell source for their systems. iPSCs are derived from adult cells that can be reprogrammed into embryonic-like cells, which can then be turned into other tissues. A goal of the Tissue Chip for Drug Screening program is to increase efforts to create a single iPSC line that can differentiate and mature into all major organ systems in the human body. Currently, researchers can use iPS cells to generate different tissues that are used in some of the tissue chips. However, no single iPS cell line can yet produce all the needed major organ tissues. Program researchers aim to tackle this problem and share their methods with the research community to galvanize this field of research. To learn more about the Tissue Chip for Drug Screening program, visithttp://www.ncats.nih.gov/tissue-chip.html.